As the temperature rise, so does the crime rate. Each summer, home burglaries increase by about 10.5 percent. Before you pack up for a summer road trip or open up all the doors and windows to enjoy some fresh air, you may want to think twice. There’s a definite correlation between summer and crime, but why? There are a few theories as to why crime rates rise during the summer. Why Does Crime Increase During the Summer? According to a report from the Department of Justice, crime is more common in the summer than the winter. 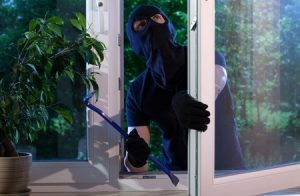 Burglaries are more than 10 percent more common, but that isn’t the only type of crime that goes up during the summer months. Household property victimization, household larceny and serious violent crimes are also more common in the summer. Why Does Summer Bring out the Worst in People? Homes may be more tempting to criminals because windows and doors are left open more frequently, and homeowners often spend less time at home when the weather is pleasant. Many criminals are opportunists, and opportunities present themselves more frequently during the summer months. But what about violent crimes? Open front doors are an open invitation for criminals, but that doesn’t necessarily explain the increased number of homicides and other violent crimes during the summer. According to studies, the reason may actually be quite simple. As temperatures rise, many people are generally uncomfortable. This discomfort can give rise to aggression which could lead to aggressive criminal activity. When crime rates are at their peak, it’s important to protect yourself and your family. Exercise common sense, and keep your doors and windows locked, especially when you aren’t home. You may also want to consider replacing your locks or investing in a home security system. At Colorado Security Products, we can help you secure your home this summer and at any time of year. Call 303-756-1000 to get started on a security plan for your home.